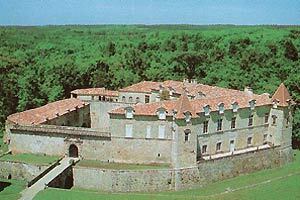 Royal site, old residence of Kings de Navarre, King de France Henri IV and the Margot queen, remains of the family Ducale of Sabran-Pontevès, the castle of Cazeneuve rebuilt in XIVe century by Amanieu VII of Albret, was restored at the request of Raymond de Vicose in the years 1600-1610 bus it was said it "uninhabited and uninhabitable" because of devastations of the war. Casteland.com particularly thanks the owners for the castle for the texts and the photographs as well as the information on this one. - of Easter to May 30 of 14 H with 18 H only weekends and public holidays. - of Ier October at All Saints' day of 14 H with 18 H only weekends and public holidays. Guided tour for the groups (10 People and more) all the year on go. The castle is closed of All Saints' day until Easter.